The SID chip inside the Commodore 64 and 128 is arguably still the gold standard for chip tunes, and the C64 itself still a decent computer for MIDI sequencing. [Frank Buss] realized most of the MIDI cartridges for the Commodore computers are either out of production or severely limited, so he set out to create his own. Unlike the few Commodore MIDI cartridges that are available, [Frank]’s Kerberos has MIDI In, Out, and Thru, controlled by the 6850 ACIA chip, just like the old 80s interfaces. This allows the Kerberos to interface with the old Sequential Circuits, Passport, and Datel software. 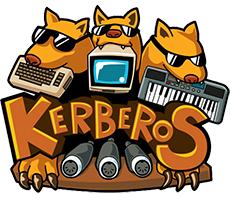 He’s offering the Kerberos cart up on a crowdfunding site, so if you’d like to grab your own, have at it. Because the Kerberos is also a Flash cart, it also ships with some of this software; [Frank] got permission from Steinberg to install their Pro 16 software with the Kerberos. SID Wizard is also pre-loaded on the cart, along with a few other fabulous trackers and sequencers. Of course, there’s no requirement for the Flash portion of the cart to only host MIDI and synth software. You can always upload a few games to the cart over a MIDI interface. Video of the Kerberos below. It doesn’t have buckling springs, Cherry blues, or even the wonderful if forgotten Alps switches, but the keyboard found in ThinkPads has the best keyboard action of any laptop around. They would make a great USB conversion keyboard, but the board to board connector is very hard to find, and no one has yet managed to get the keyboard and track point working as a USB HID device. Until [rampadc] came along, that is. [Rampadc]’s keyboard adapter is built for the ThinkPad T60 keyboard, which is shared between the Lenovo T60, T61, Z60, Z61, R400, R500, T400, T500, and X41 laptops, among many others. The connector is an extremely odd proprietary deal, that can be found through the usual channels for about $5 in quantity 100. 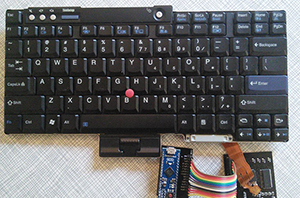 On top of this, the keyboard doesn’t have a controller – that’s offloaded to the laptop’s main board. The only electronics in this keyboard is just a matrix. Despite all this, [rampadc] managed to create a breakout board with a decade counter and an SPI GPIO expander. The board [rampadc] made features one of the proprietary connectors, a few chips, and a receptacle for an Arduino Micro. With just a little bit of code, the old keyboard becomes one of the best portable keyboards in existence, and probably a bit cheaper than the official Lenovo USB-bound ThinkPad keyboard. [rampadc] has a few of the expansion boards available over on Tindie should you want to build your own. It’s only cost-effective if you have one of these T60 keyboards sitting around in a junk pile; not a likely situation because these machines just don’t die. A new edition of The Hacklet is now available It covers some of our favorite stuff going on in the Hackaday Projects community. In this edition, we round up a few hacks involving cars. There’s Bluetooth Low Energy connectivity, vehicle telematics, and tools to hack into your car’s CAN bus. If you’ve ever wanted to clear that pesky check engine light without paying the dealer, or unlock your car with a smart watch, these are worth a look. Next up are a bunch of LED hacks. This starts with a DIY theater light, then looks at a portable DJ booth, finishing off with our Evil Overlords’ own LED visualization platform. Finally, we check out a new 3D printer design. This one uses polar coordinates instead of the Cartesian coordinate system that most printers use. This gives it the unique ability to print with multiple extruders at the same time. Once again, let us know what you think of this edition in the comments. Our goal is to keep you entertained with some of the coolest hacks on the site. The entry period for the Sci-Fi Contest ended at mid-night yesterday morning. Now’s the time to weigh-in as ten prizes will be awarded based on the community outpouring for the project. Go check out all of the projects that were entered and register your opinion through “Follow Project” and/or “Give a Skull” buttons. We’re hoping to announce judging decisions for the contest on Thursday, May 8th. What’s this? A 2-Dimensional wooden camera cut-out? Nope. We lied — it’s actually a digital camera squeezed into 1/2″ sheet of walnut! [Olivia Barr the Third] originally made this for her 101-year-old grandmother [Olivia Barr the First], who recently got into photography in her late 90’s! [Olivia] wanted to make her a digital camera that was light and easy to use. She succeeded and has started an art project over at notacamera.tumblr.com — Spy photography? Kind of? The small 3″ x 3.5″ camera packs an HD video camera with 16-bit mono audio, and is able to take 1280 x 960 stills. It uses a microSD card, a 3.6v 250mAh battery and has a power button, status LEDs and even a USB port. It was laser cut out of 3 sheets of walnut board and glued together, sandwiching the components in place. Just for fun, she’s also made a “selfie” version which is laser etched onto a piece of mirror for easy framing of your face.